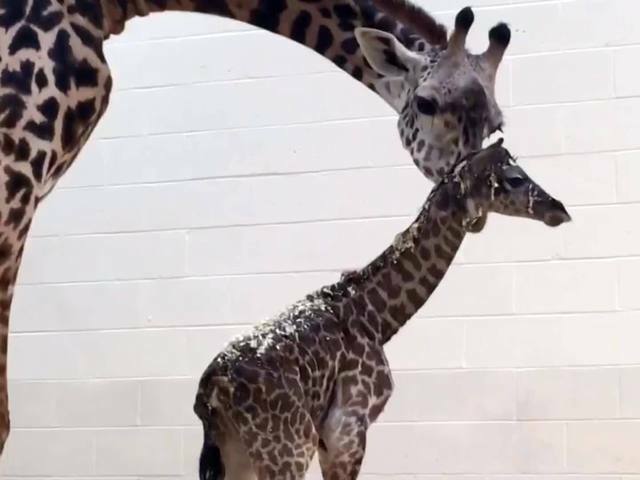 CINCINNATI -- It's not surprising that Cece, a giraffe at the Cincinnati Zoo and Botanical Garden, gave birth to a 6-foot-tall baby. She's a giraffe, after all. The surprising part: She spent only 30 minutes in labor. Zookeepers noticed Cece wouldn't leave her stall to go outside Wednesday morning. She went into labor at 9:57 a.m. and delivered her calf at 10:27 a.m., an "unusually quick labor," the zoo said. Cece and the calf will spend a few days inside, bonding, then go to the Giraffe Ridge exhibit with the zoo's other female giraffes, Tessa and Jambo. Cincinnati Zoo Director Thane Maynard said the calf is healthy, and Cece handled her labor and delivery well -- especially considering she's a first-time mom. Kimba, the zoo's male giraffe, will be kept in a separate yard, but zoo spokeswoman Michelle Curley said he'll be reunited with the group in a week or two. It's the 14th giraffe born at the zoo since 1889. Cece came to Cincinnati in 2013 from the Kansas City Zoo on a breeding recommendation from the Association of Zoos and Aquariums’ Species Survival Plan. Kimba arrived in 2008 from the Roger Williams Park Zoo in Providence, Rhode Island. He's sired three calves with Tessa, and Jambo's calf will make him a five-time dad. Although their numbers have decreased in the past century, giraffes are not currently endangered, but listed as “lower risk” with fairly stable populations. Unlike many species, there is no true breeding season for the Maasai giraffe, and females can become pregnant beginning at just four years of age. In the wild, up to 75 percent of the calves die in their first few months of life, mainly due to predation.